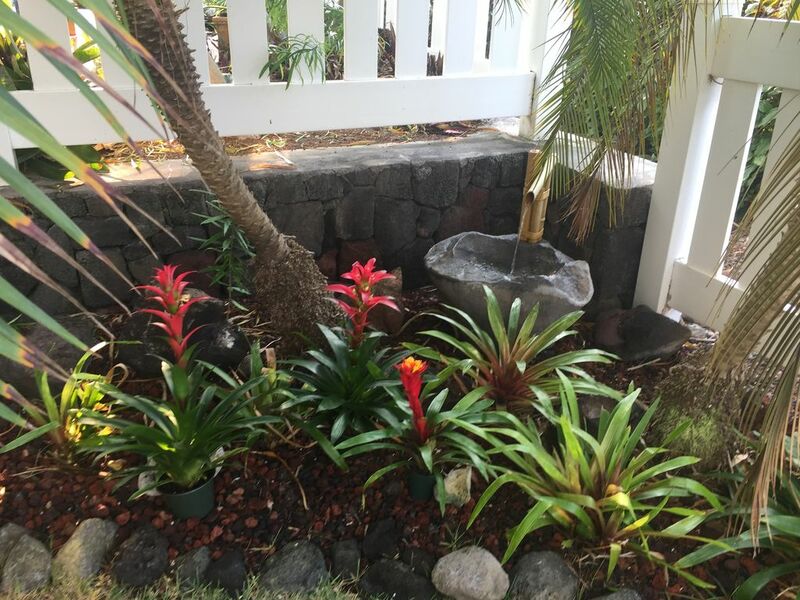 Beautiful 2 bedroom 2 bath first floor corner unit on Alii Drive with a beautiful BACKYARD! Have dinner outside on the double lanai. Dining table with umbrella seats six people. Having an outdoor grassy YARD to hose off after the beach, and sip your drinks on the lanai will make you feel like you are in a home. This unit has just been extensively remodeled! The unit features new cabinets and granite countertops. There is a beautiful dining room table (seats 4), and cool Mexican tile in all the main living areas and bathrooms. Both bedrooms feature brand new carpeting, and the closets are custom built. Master bedroom has a walk in closet. All of the furniture is brand new! Just installed a Samsung stackable washer/dryer, as well as three brand new A/C units. Also comes with high speed internet, and HD Smart TV’s- PREMIUM cable included! You can also access Netflix, Amazon video, and more!) There is a Weber gas grill on the lanai for your barbecuing pleasure. (lots of fresh fish!) This first floor unit"s BACKYARD is the biggest in the complex. Complete with a trickling waterfall for relaxing after a busy day on the Island. Walk to Kona, or take the trolley that runs up and down Alii Drive! Lots of restaurants, shopping and beaches within walking distance! Peek-a-Boo ocean view from the lanai! There are two resort style pools and a jacuzzi! Your cleaning fee INCLUDES one mid-stay cleaning. Beach chairs/umbrella, boogie boards, masks/snorkels, beach towels and sand toys, are here for your enjoyment. 30 day minimum booking, but up to you as far as length of stay. Sleeps 4. Alii Lani is a NON-SMOKING condominium complex. My name is Lauren Batlle, and our family lives in Miami, FL. This property is great because it is on the bottom floor, and lives more like a house than a condo. The backyard is lush and green, and the large covered patio and dining table patio enhance the living experience to the outside (as it should be in Kona!). One of the greatest things about this condo, is the fact that there is an air conditioner in every room! It can get pretty hot in Kona, and it feels great to relax in the A/C after a long day on the beach! Another thing I love about this condo is looking out the bedroom windows early in the morning. The dew is still on the grass and you can usually spot a beautiful bird or two in one of the many trees in the yard. There are multiple small beaches along Alii Drive. I have walked to the beach from the condo many times. There is a peek a boo view of the ocean from the lanai. There are some books in the unit, as well as a lending library at the main resort pool. Two masks and snorkels, two boogie boards. Love this location and great condo. It was like being home, so comfortable. Owner is very accommodating and kind. We loved our stay and will repeat for sure. My husband and I stayed in this lovely condo while waiting for our house to close. It is just as pictured and well appointed. We had everything we needed in the kitchen to prepare meals. The small backyard is green and lush. We enjoyed both pools and hot tub. As we stayed for over a month we met many of the residents and all greeted us with aloha. Highly recommend! The unit was very clean and well stocked. The beds were amazingly comfortable. Very nice unit. Very nice, clean, and comfortable unit. My husband and I and our two friends stayed here for 31 days and felt right at home. The unit was well stocked with all the essentials and the beds were super comfortable. We would definitely recommend this condo to others. The condo was clean, well stocked and comfortable. Owner was responsive with any questions and concerns we had, and the complex felt very safe and quiet. I would reccomend this condo to anyone staying in Kona. The unit was very clean and organized. It was simply and turnkey. After an excruciatingly long flight I was very pleased with all the creature comforts. I felt as though Lauren had thought of everything. I got in late so it was nice to be able to simply grab some food and have everything else waiting at the condo. For anyone wishing to explore Kona you really can't beat the location. It's a short walk to several small beaches, the farmers market, and the oceanfront restaurants. I will definitely book my stay with Lauren next time I travel to Kona. In addition to beaches/snorkeling, there are many other activities to do in and around the Island. Star gazing tours to Mauna Kea, helicopter tours of the Island, deep sea charter fishing, golf, tennis and an evening Manta Ray swim and an active volcano are some of the truly amazing experiences that wait for you on The Big Island.